Iraq has finally amended its electoral law, paving the way for general elections to go ahead no later than 1 May 2014. The most significant change to the electoral law concerns the seat distribution method. Following a supreme court ruling that deemed the previous largest-remainder principle unconstitutional, a more proportional, so-called modified St. Lague method will be used to calculate seats. This gives smaller parties slightly better chances to win seats than under the previous system. Other major systemic changes that were on the table were all dropped. There will be no change to the open-list system, nor will there be any revision to a single, nationwide electoral constituency, which the Kurds had pressed for. Instead, there are minor adjustment to the seat distribution between governorates. The seven seats that were distributed to the winning blocs at the national level in 2010 have been allotted to governorates instead, and three extra seats have been added to the mix. The governorates that won one extra seat each are Baghdad, Basra, Dhi Qar, Babel, Karbala, Anbar, Diyala, Erbil, Dahuk and Sulaymaniyya. The eight minority seats remain the same. It is noteworthy that in this way, the Kurds came best out of the new apportionment. Compare with 2010, where the Kurds eventually won one of the seven national/compensation seats, or 14%. This time they are guaranteed a third of the ten seats that are allotted on top of the 310 seats that are distributed based on population statistics. Kurdish assertiveness in this question in turn reflects their historical dissatisfaction with the ministry of trade statistics (based on ration cards) used to determine the number of deputies per Iraqi governorate. The Kurds had hoped that ministry of planning estimates would be used instead, thereby increasing the number of MPs to 351. When this didn’t happen, the Kurds achieved a respectable second best alternative through a disproportional increase in the newly added governorate seats. Generally speaking, since the Kurds have reasonable internal coherence and discipline among its parliamentarians, seat increases work in their favour. Conversely, the Shiite Islamists have strenuously fought against seat increases, probably fearing even greater fragmentation as a result. For their part, the secular (and now increasingly Sunni-backed) Iraqiyya has already fragmented to such a degree that its leaders may have supported the Kurdish position simply in the hope that any increase in seat number would offer them a greater chance to keep their own personal seats! It is noteworthy that in the end, clear signals from the Shiite clergy expressing disapproval of a seat increase were not adhered to entirely. 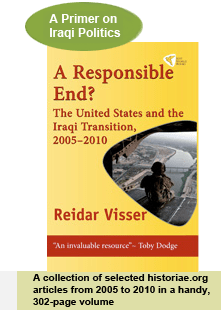 Some sources suggest the United Nations Mission in Iraq (UNAMI) played a role in facilitating a compromise on this issue between the Kurds and the Shiite Islamists. One caveat concerning the new law needs to be mentioned: Its status as a “law proposal” rather than a “legislative project”. The Iraqi federal supreme court has consistently struck down such proposals as unconstitutional when challenged (and especially when these laws are unfavourable to Prime Minister Nuri al-Maliki). It might do so again, simply for consistency. An even trickier issue concerns the Yazidi minority quota, which the court itself ordered be adjusted upwards in 2010 – that didn’t happen today (and the Yazidis protested). There are however two ameliorating factors here: Firstly, with regard to the overall status of this act of legislation, the new law was passed as an amendment to an existing law, rather than as a brand new law. Second, the new law successfully addresses specific and overriding issues that the supreme court itself had raised regarding seat distribution method. Hopefully, there is now so much momentum towards elections in April 2014 that no side will try to fish in the legal murky waters that admittedly exist. It would, after all, be a parody if the supreme court used a technicality to strike down legislative amendments that the court itself had previously dictated. This entry was posted on Monday, 4 November 2013 19:51 at 19:51	and is filed under Iraq parliamentary elections 2014, Uncategorized. You can follow any responses to this entry through the RSS 2.0 feed. Both comments and pings are currently closed.